Whilst all the headlines about yesterday’s Budget have attacked the Chancellor’s new ‘Granny Tax’ on middle class pensioners, it will be the poorest households who lose most come April. 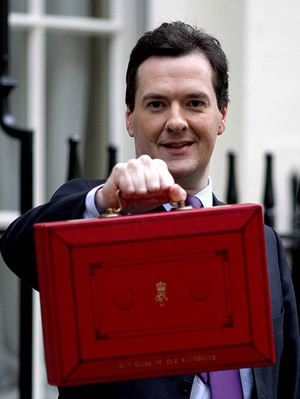 There has been a growing tide of criticism of the Coalition’s third Budget, since George Osborne delivered his budget speech yesterday. Media coverage has been overwhelmingly negative – mostly on the basis of the perceived unfairness of cutting the 50p top rate of tax for the wealthiest – at the expense of a new ‘Granny Tax’ on Britain’s pensioners. The Chancellor is rightly being taken to task for handing out tax cuts to the wealthiest 1% of taxpayers: Cutting the 50p tax rate amounts to a handout of over £40,000 to every millionaire in the country (unless, that is, they are engaged in what Osborne himself described as ‘morally repugant’ tax avoidance). At a time of increasing austerity, escalating unemployment and a doubling of the numbers turning to food banks, there can be few more morally repugnant things a Chancellor can do than to hand thousands of pounds out to millionaires. Yet, if you delve into the detail of the Budget statement itself, the Tresury’s own analysis is that the poorest half of households will be losing a greater proportion of their income than four fifths of the wealthiest half of the population. Taking the overall impact of spending, tax, tax credit and benefit changes into account, the poorest fifth of households are hit twice as hard as the majority of people in the top 40%. Previously announced cuts to tax credits worth £2 billion will come into effect in April, hitting poor families – including those in work – hard. As I explained earlier in the week, over 200,000 families in work will lose all entitlement to tax credits – costing each family up to £4,000 a year. And the Government’s wider Welfare Reform programme is expected to lead to hundreds of thousands of people losing entitlement to disability benefits over the next 12 months. Independent analysis by the Institute for Fiscal Studies has suggesting that child poverty will rise by 400,000 children in the current parliament, and a further 400,000 children in the next parliament, under the government’s current distribution of measures for deficit reduction. Ominously, the Chancellor indicated that a further £10billion of cuts to the ‘welfare’ budget have been pencilled in for after the next General Election. The media agenda is yet again leading its Budget analysis with an agenda set by its impact on the middle classes. But the real story is the Government’s failure to honour its pledge in the Coalition Agreement to protect the poorest and most vulnerable from the impact of spending cuts. Not so much a question of the squeezed middle as of the pinched bottom. So here we are again, the conservative party is robbing the poor to serve the rich, I thought we would have learned our lesson. How can it be morally right to give the wealthiest people in Britain tax cuts adding around 40,000 to some of their income in a year, which probably does not mean anything to them, whilst it would make the world of difference to the poorer in our Nation. I emigrated to Canada at the beginning of last year, and I think it is the best decision I have made for a long time. I am truly ashamed to be connected to a government who are systematically ruining our once proud Nation, and the people who live there.